This week has just been plain crazy. The hubs got sick, was in and out of the ER for two days, and is now scheduled for a procedure tomorrow that will leave him incapacitated the rest of the week. In between all the traveling, arranging emergency babysitters, making appointments, filling prescriptions (you get the idea) I’ve still had work to do, and a household to run and feed. 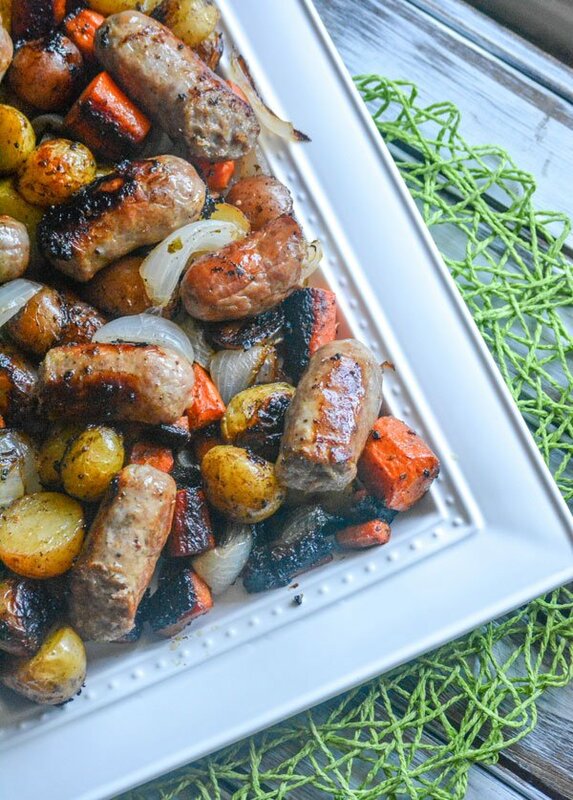 While it does take some time to cook, this wonderful, one-dish Italian Sausage, Potato, & Balsamic Vegetable Casserole recipe is perfect for nights like I’ve had this week. This hearty meal filled the sons up and, without a lot of prep or real work involved on my part, I was able to get laundry done, and everything in order that I had neglected earlier in the day while it cooked. I don’t think before this week, I had ever really taken time to appreciate the beauty of throwing all of these ingredients into a pan, popping it in the oven, and basically having time to do whatever else I needed to get done, be it chores, read a book, return phone calls. And have a healthy, piping hot dinner ready in a little over an hour later. It’s impossible to be in two places at once, and after the start to this week, I just wasn’t capable of any ‘exceeds expectations’ multi-tasking. 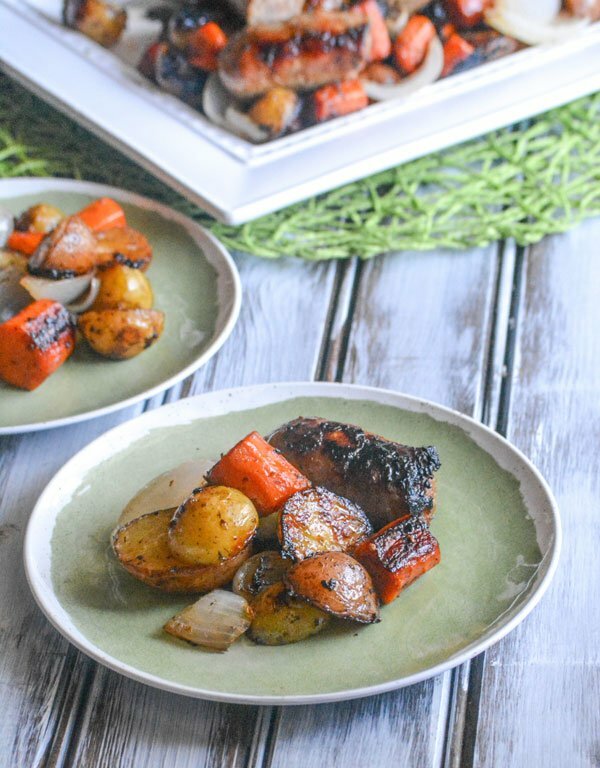 While I wasn’t able to have a ‘lazy day’ this week, this recipe was the perfect solution for my dinner-time dilemma. And on those days where I am just being lazy (Shhh! Don’t tell the hubs. 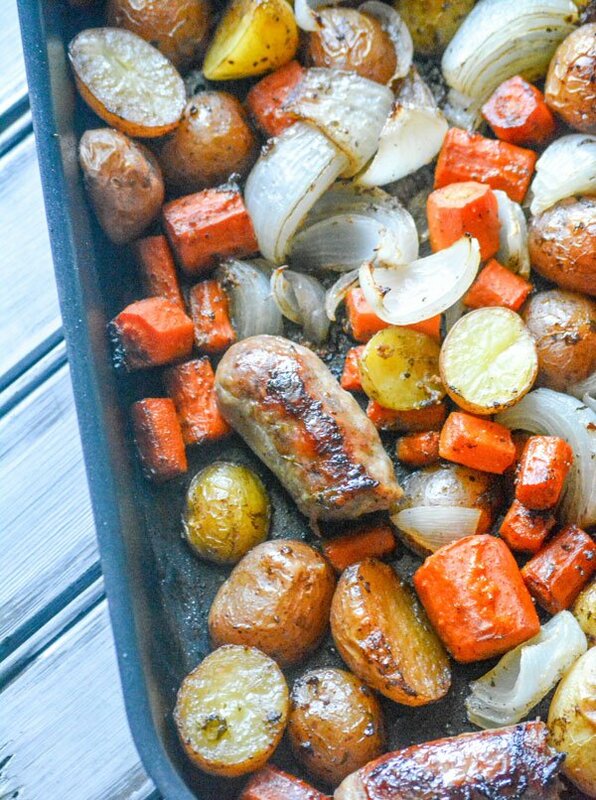 He thinks I slave away perfecting gourmet meals all day, everyday) this Italian Sausage, Potato, & Balsamic Vegetable Casserole meal gets my ‘meat & potato’ loving mens’ mouths watering! this recipe will make your day. 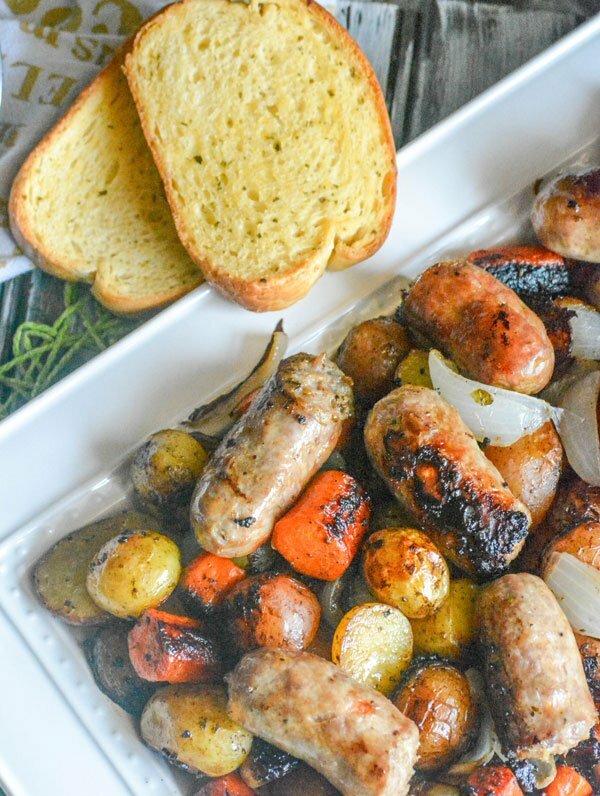 Serve it with some garlic bread and a simple side salad for a full meal you’ll feel good about serving, when you didn’t even feel like serving anything at all. Other easy supper ideas for lazy days that you might enjoy: Cheesy Bacon Cheeseburger Tater Tot Casserole, Creamy Chicken & Caesar Wild Rice Casserole, Sheet Pan Meatloaf Supper, and Loaded Italian-Style Sheet Pan Nachos. 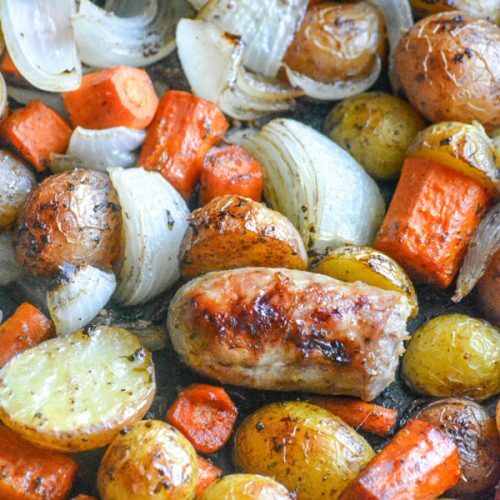 A hearty meat & potatoes meal, this comfort food casserole is easy with savory roasted veggies all in one dish. 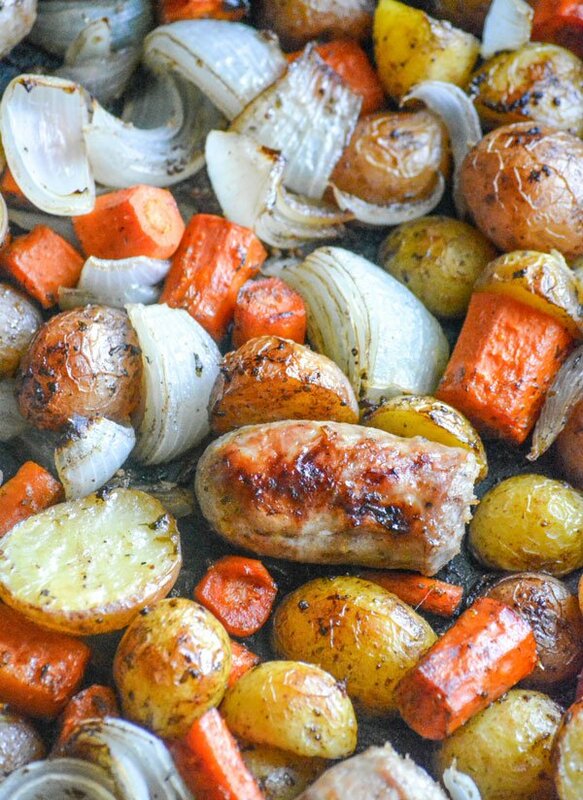 Put all the prepared vegetables into a large roasting pan, or a 9x13 baking dish. In a bowl combine the garlic, oil, herbs, broth, and vinegar. Pour the mixture evenly over the vegetables and season with salt and black pepper. Cover the dish with aluminum foil and bake at 450 degrees for 45 minutes. Lightly brown the sausages and cut them in half. After 45 minutes add the sausages to the dish and spoon some of the juices back over the vegetables and the sausage. Bake, uncovered, for an additional 30 minutes, flipping the sausages after 15 minutes and placing back in the oven for the final 15 minutes. I am definitely making this!!!! Sounds so good! For cleaning those burners and burnt pans try cleaning with baking powder burnt on food lifts right off the pan. Especially if you fill pan half way up with water, bring to a boil, add baking powder about 1/8 to 1/4 of a cup and turn down to simmer for a few minutes until water mixture thickens a bit. Baking powder foams up so allow plenty of room between the rim of the pan and the water level. Best part is baking powder is nontoxic. Let me know how you like it! Thanks for the tip for cleaning the burners. Cleaning those pesky things is on my to-do list for today! Anything that will help lift that grime is great, since I usually just end up scrubbing them forever with some steel wool and good ol’ fashioned elbow grease. I’m so sad to hear this. We love this meal. I’ve never had my carrots come out like rocks. They do cook quicker the smaller they’re sliced, but I don’t see why baby carrots themselves should make a big difference. 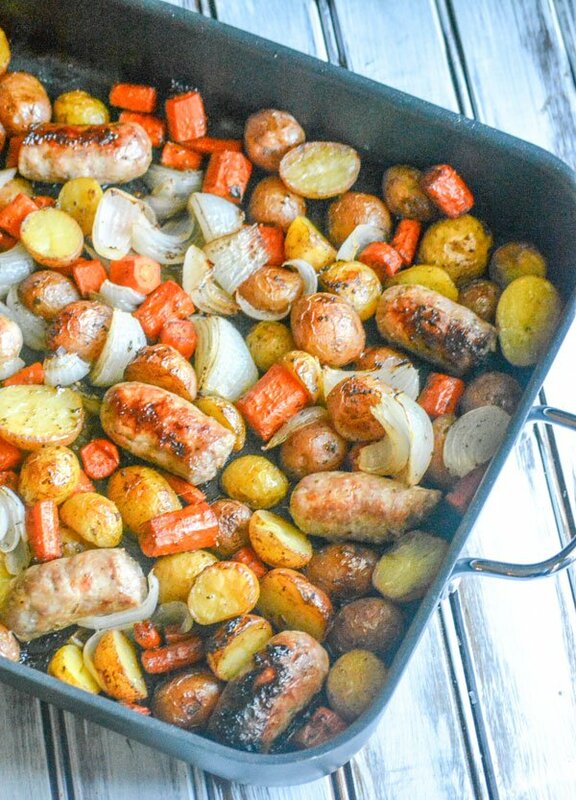 I just make sure it’s covered tightly with foil (sealed) for the first bake time, and make sure to spoon the juices over the veggies before adding the sausages and baking again. If you want to be 100% sure they turn out, you can try slicing them or even blanching them before adding them to the baking dish.